Attackers dressed in military fatigues and allegedly supporters of an Arab separatist group waded into a military parade by the Iranian Revolutionary Guards Corps in the Iranian city of Ahvaz spraying bullets in a brazen public attack killing dozens captured on live television and social media. 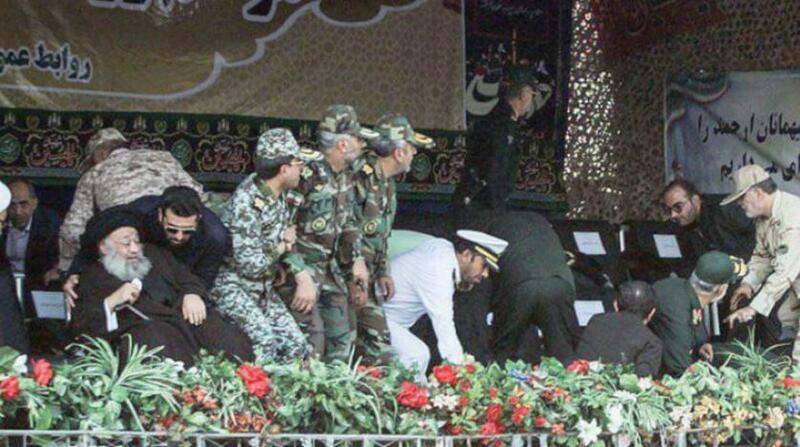 The images from the attack on the regime’s vaunted IRGC elite sprawled helplessly on the ground and in some cases even running away or hiding in a drainage ditch contributed to an image contrary to what the mullahs have carefully sought to cultivate of military might. It was the deadliest terrorist attack within Iran since an assault on Iran’s parliament in 2017 that ISIS claimed credit for. While this attack was claimed by ISIS and little-known group calling itself the Ahvaz National Resistance, the Iranian regime instead sought to blame the U.S., Saudi Arabia and the Gulf States. Top mullah Ali Khamenei himself blamed the Arab countries in the Persian Gulf and the U.S., while other Iranian officials also claimed Israel was behind the attack. Iranian officials provided no evidence that the countries they blamed were behind the attack. The U.S. and the Emirates issued statements dismissing the accusation. Predictably the accusations came with promises of a heavy response from the IRGC, but it’s is doubtful it could do much since direct military action against the U.S. or Saudi Arabia would undoubtedly only provide them with the provocation necessary to go after Iranian military assets in Syria and Iraq. Unlike last year’s attack on parliament, Iranian officials sought to downplay the terrorism angle with this attack and instead focused on its regional enemies. The difference in accusations was important since it reflected the changing political realities inside Iran. Domestic protests and widespread civil unrest have plagued the mullahs since late last year and have only continued through 2018 as Iranians rebel at the poor economy, dimmed employment, death spiral in currency valuations and rampant corruption and incompetence within the government. That domestic unrest has forced the mullahs to look for scapegoats which is why it has increasingly focused on perceived enemies abroad including Iranian dissident groups around the world; most notably its longtime nemesis the Mujahedin-e Khalq (MEK). In keeping with the central messaging from Tehran, the Iran lobby weighed in by raising the specter of war between the U.S. and Iran with this incident a potential catalyst. “It is impossible to discount the possibility that this attack was deliberately timed and targeted to prompt an escalatory response from Iran that triggers a broader war with the United States. American officials spent this week issuing veiled threats against Iran. American ally Saudi Arabia has also, dangerously, warned that it would take the fight inside Iran. Moreover, National Security Advisor John Bolton last year called for assistance to Iranian separatist groups, including Khuzestan Arabs who claimed credit for today’s attack,” read a statement by the National Iranian American Council, a leading cheerleader for the Iranian regime. Trita Parsi, the NIAC’s founder, also chimed in with an editorial in Middle East Eye in which he claimed this attack could similarly trigger a war with the U.S.
“Unlike previous terror attacks, this one may spark a much larger regional conflagration – involving not just regional rivals Saudi Arabia and Iran, but also the United States. In fact, it may have been designed to trigger just that,” Parsi writes. Parsi goes on to echo, almost verbatim, the charges made by Iranian officials in claiming how Saudi and American belligerence was fueling the violence against Iran. The effort by the Iran lobby to deflect any potential homegrown terrorism reflects the need by the regime to shift any attention from the internal problems confronting it and instead attempt to turn Iranian ire outwards lest it focus on the clerics rule and call for regime change. The shift also explains Tehran’s stepped-up efforts to mount military strikes against its enemies abroad such as Iranian Kurdish fighters in Iraq and Iranian dissident groups meeting in Paris in an attempted bombing. All this stepped-up aggression by Tehran demonstrates the regime’s increasingly desperate efforts to distract an unhappy population over its own growing domestic troubles. Krishnadev Calamur, a staff writer at The Atlantic, pointed out the irony of Iran blaming the U.S. for the attacks. “The problem with Iran accusing the U.S. of orchestrating the latest attack is that it distracts from Iran’s own difficulties protecting itself from such incidents one year after a similar attack. What’s even more striking is that this is the second attack on a well-protected area. This says as much about Iran’s ability to put in place security measures that prevent high-profile attacks as it does ISIS’s ability to carry them out,” he writes. “The U.S. response, both then and now, appears to suggest that Iran’s problematic domestic and foreign policies are to blame for terrorist attacks—ironically, a rationale lifted straight from the playbook of those who blame American foreign policy for the various attacks that have been carried out on U.S. soil since 2001, including the most recent ones claimed by ISIS,” he adds. The senior commander of the Revolutionary Guard Corps, Brig. Gen. Esmayeel Kossari, said the reactions in Saudi Arabia and the United Arab Emirates – along with “documents” that he said had been found in Iraq and Syria — were proof that “the Americans gave orders to Riyadh and supported this attack.” He was quoted by Iran’s FARS news agency. The high-level military officers also warned that Iran will seek revenge, according to National Public Radio. “We promise to show an annihilating and destructive response which makes them (the culprits) regret their deeds and no one will be able to kill our children in this territory, and this will not be the end of the story and we warn everyone that we will take revenge,” said Brig. Gen. Hossein Salami, the Revolutionary Guard’s lieutenant commander, according to FARS. It seems the only party talking about raining death and destruction on people is the Iranian regime.